You haven’t done Christmas in Austin without a trip to the Trail of Lights. 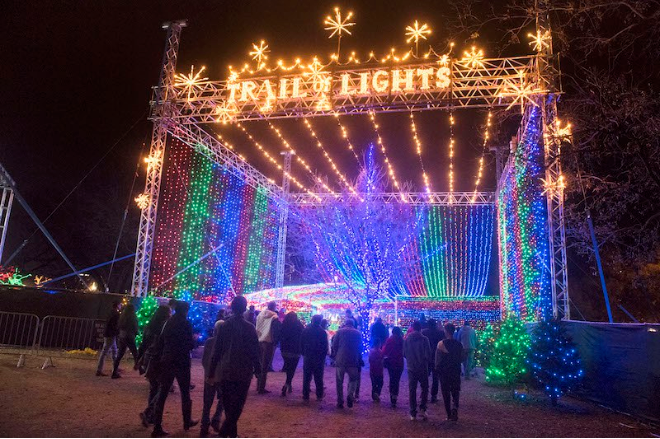 Two million lights take over Zilker Park, making for a spectacular walk with food trucks, holiday activities, and live music performances along the way. Another light-filled extravaganza is Circuit of the Americas’ Winter Wonderland. Admire the glowing, handcrafted sculptures of creatures such as dragons, pandas, and smiling moons featured at its Chinese Lantern Festival, then glide (or fall) with your date across Texas’ biggest outdoor ice skating rink. Round Rock’s annual Christmas Towne boasts more glorious light displays. Entrance is free, but for eighteen bucks, ride your little hearts out on the full-scale carnival rides (the Century Wheel looks like the perfect setting for a perfect kiss.) If a chat over coffee is your idea of the perfect first date, liven it up with a cup at Mozart’s. During the winter, the place decks out their patio overlooking Lake Austin with over a million LED lights. Catch their nightly light show while snuggled up to a cutie and sipping on hot chocolate.